But a couple of questions for you, as one familiar with the Burbank area. In the photo of c/n 1060 = VH-UXH, with the hangar behind it and the mountains in the background, in what direction would you say the camera is facing? Not east or east-northeast? And on what basis do you judge that the smoke is east of the airport? And note the windsock in both photos. Isn't the wind there usually from the south during the day? Or do I have it backwards? The San Gabriel Mountains run east-west, separating the San Fernando Valley (Burbank is at the eastern end of the valley) from the San Joaquin Valley and the Mohave. Looking at the photo of VH-UXH we see the mountains in full illumination (few shadows in the draws) which would logically follow as the San Gabriels are north of Burbank. If we were looking at the coastal mountains to the south, the illumination angle would be steeper (north slope being illuminated at a very small angle) and the draws would have greater shadowing. If we believe that NR16020 was turned either following or preceding the "Amelia striding" photo to take the "Amelia standing on the tail" photo (relatively change of the sun angle for best subject lighting) and knowing that VH-UXH was turned similarly (tailwheel right off the edge of the pavement), then from the orientation of the mountains we can deduce that both aircraft were facing roughly east with the mountains on the aircraft's port side. If that's indeed the case, our smoke column is to the east. Union Air Terminal in Burbank was a polished facility and the many photos of NR16020 known to have been taken there reflect that. Was there some scruffy, unkempt corner of the field where these photos could have been taken? And why would AE and Mantz take the airplane there for a photo shoot? Agreed this is curious. There are quite a few photos of Lockheed/Burbank facilities spanning this time period but I can't spot any candidate for the hangar in question. If it's not Union Air Terminal/Burbank, then the identification in the caption for the VX-UXH is wrong. I quite sure that's the same hanger in both photographs. I am sure that it is Burbank - I was able to match the ridgeline in the VX-UXH photo in Google Earth. The camera is facing just slightly north of due east. I would also agree that the hangars match - there are numerous features that line up right down to the shading of the vertical stripes above the open door. The camera is facing almost south... the ridge in the VX-UXH photo is behind the camera. Take note of the hangar dead center in the photo - I am wondering if this is our hangar. Note the prominent stack a few buildings to the north, which can be seen in the VX photo. Also note that just south of the closest plane to this hangar is what appears to be a paved section of ramp, which is what VX is parked on. If my speculation is correct, the Electra would have been parked close to the grass landing strip, in a logical place after exiting the factory complex. I also found another photo of the whole airport complex in 1936. The important point is that the Lockheed plant was a considerable distance away from the main runway/terminal complex and was separated by undeveloped fields. So, it doesn't seem so odd that the gaudy terminal building is not on display here. Lockheed bought the entire airport in 1940 and considerable expansion followed during WWII. The Lockheed plant had its own gravel strip which was separated from the Union Air Terminal, and there were actually houses and fields in between. In the second Electra photo, nose-on, I think we are seeing that strip just behind the plane. In the distance are the houses, trees, and telephone poles in those fields. Taken from this page: http://dmairfield.com/airplanes/NC336H/index.html, the caption says Lockheed Vega NC336H, ca. June 1929, Burbank, CA. I think all of this demonstrates that this hangar was used for aircraft construction by Lockheed (note that a year later this side of the plant became the Vega subsidiary) and it would not at all be unusual for the newly-completed Electra to be parked out front. I think the photos in question were taken just after the plane rolled out. What do you think? ... I think the photos in question were taken just after the plane rolled out. What do you think? I think you guys are AMAZING! Good get Kevin. 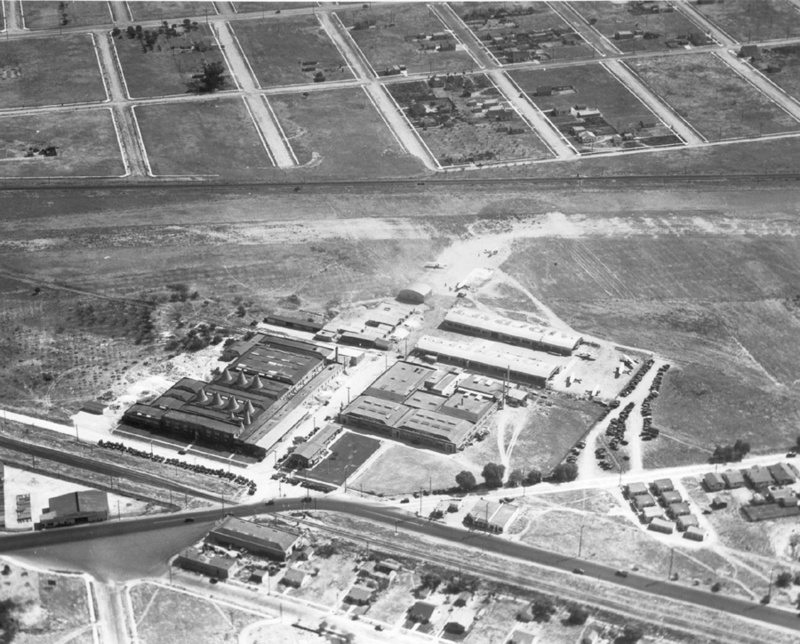 Notice that airfields-freeman.com dates a nearly-identical image (Lockheed plant 1930.jpg, with planes on the ground in exactly the same positions) differently: "A 1930 aerial view of the buildings at the original Lockheed plant (courtesy of Dan MacPherson)"‬. The website wesclark.com has a wider view cited as 1928. This (‪lockheed_wide_aerial_1928.jpg‬) must be an east-facing view taken on the same date. But, how many differences can you spot from this (‪original_lockheed_plant_1928.jpg‬)? Sources: wesclark.com. I hope I am not beating a dead horse here, but I was browsing the timeline and saw the photo from the White Star Line Archives. The mountain in the upper left of the picture matches exactly in Google Earth today; it is the easternmost peak in the Verdugo Mountains due north of Burbank. Apparently the fire roads have been there forever because they look identical today. As noted in the timeline the weeds by the engine are the same, therefore this picture and the mystery pictures are at the same location. My conclusion is that the photos were taken in front of the hangar at the Lockheed plant; the Electra is parked facing west. In interpreting your 1928 photo of the Lockheed complex, it's helpful to have in mind that the Burbank airport and terminal were not completed until 1930. Memorial Day weekend was the official opening. 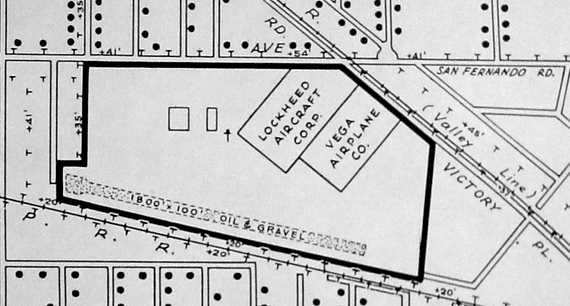 So the Lockheed airstrip as depicted in 1928 predated the United Airport and fancy terminal, which were yet to be built, on a separate parcel of land about a mile to the west of the original Lockheed complex. Lockheed maintained this airstrip all through the 1930s and into the early 1940s, as a facility separate from the Burbank airport. The airport has been United Airport (1930–1934), Union Air Terminal (1934–1940), Lockheed Air Terminal (1940–1967), Hollywood-Burbank Airport (1967–1978), Burbank-Glendale-Pasadena Airport (1978–2003), Bob Hope Airport (2003–2016), and Hollywood Burbank Airport (2016-). Boeing Aircraft and Transport (BA&T) was a holding company created in 1928 that included Boeing Aircraft and United Air Lines, itself a holding company for a collection of small airlines that continued to operate under their own names. One of these airlines was Pacific Air Transport (PAT), which Boeing had acquired because of PAT's west coast mail contract in January 1928. BA&T sought a site for a new airport for PAT and found one in Burbank. BA&T had the benefit of surveys that the Aeronautics Department of the Los Angeles Chamber of Commerce had conducted starting in 1926 to identify potential airport sites. It took BA&T a year and the cooperation of the city to assemble the site. The 234-acre (0.95 km2) site was rife with vines and trees and the ground had to be filled and leveled, but it had good drainage, a firm landing surface, steady winds, and good access to ground transport. Construction was completed in just seven months [1929-30]. In an age when few aircraft had brakes and many had a tail skid instead of a wheel, runways were not usually paved; those at Burbank had a 5-inch-thick (130 mm) mixture of oil and sand. There were no taxi strips, but the designers left room for them. Two of the runways were over 3,600 feet (1,100 m) long; a third was 2,900 feet (880 m); all were 300 feet (91 m) wide. Generous dimensions, and the site had room for expansion. United Airport was dedicated amid much festivity (including an air show) on Memorial Day weekend (May 30 – June 1), 1930. The airport and its handsome Spanish revival terminal was a showy competitor to nearby Grand Central Airport in Glendale, which was then Los Angeles' main airline terminal. The new Burbank facility was actually the largest commercial airport in the Los Angeles area until it was eclipsed in 1946 by the Los Angeles Airport in Westchester when that facility (formerly Mines Field, then Los Angeles Municipal Airport) commenced scheduled airline operations. The Burbank facility remained United Airport until 1934 when it was renamed Union Air Terminal. The name change came the same year that Federal anti-trust actions caused United Aircraft and Transport Corp. to dissolve, which took effect September 26, 1934. The Union Air Terminal moniker stuck until Lockheed bought the airport in 1940 and renamed it Lockheed Air Terminal. While we're on a roll, can we identify the location for the photo provisionally placed at July 19 1936 in the timeline? Visible elements are: an unmarked 10E, sitting on a concrete pad, next to a building having at least 5 peaked roof sections adjacent to a large flat-roofed section, with a wire fence and grass along the opposite edge, trees in the background, and a diffuse plume of smoke on the horizon. The source is the Purdue archives, with no other information. Exactly where and when was this photo taken? That is still Lockheed's own strip we are looking at, not the main runways of Union Air Terminal (they were to the south, off the bottom of this picture). I also see that there have been drastic changes since 1928 in this image... the small hanger is long gone and many larger buildings have been constructed.